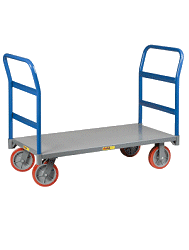 This hand truck has wheels made of the highest quality materials with a 3 year warranty to back them up. Extruded axel brackets aslo come with a lifetime warranty. The axel is made of 91,000 PSI tensile steel making it super strong for heavy loads. The nose plate is constructed of extruded aluminum for longer life. The frame is constructed of lightweight aluminum boosting a 600 lb capacity. The frame cross members are four sided ribbed construction and add exceptional support to an already strong frame. The rivets used to construct the hand truck are made of 700 lb aircraft grade aluminum for long life stability and durability. Parts are interchangeable with most competitor's models. Dimensions 62" x 21.5" x 20"